T-Mobile may not have deep enough pockets to convince Apple to build an iPhone fully compatible with its network, but the operator surely has enough marketing funds to constantly remind iPhone buyers that they are making the wrong choice by agreeing to buy a phone riding on its competitors’ networks. 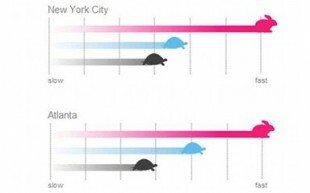 The wireless provider, who recently rolled out a so-called ‘4G’ network, just released a new set of ads stressing how slow Verizon and at&t’s 3G networks can be when compared to T-Mobile’s. While nicely put together, the new campaign is extremely misleading, as T-Mobile is really comparing apples to oranges (no pun intended). 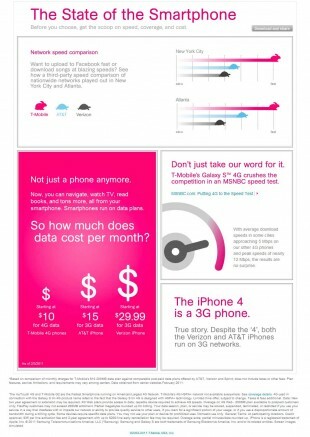 T-Mobile’s network is an HSPA+ network, which is the latest revision of UMTS, a 3G technology. The operator may call it 4G, truth is, it’s really not. Having said that, T-Mobile does have the advantage when it comes to speed, as the mobile service provider was one of the last operators to update its 3G network, and is now able to offer higher throughput than its competitors in some markets. But this advantage may soon prove to be short lived, as full-blown 4G networks are currently being rolled out by both at&t and Verizon Wireless. These networks use a completely new technology called LTE, a truly 4G technology, and in the markets where T-Mobile currently peaks at a maximum of 21 Mbit/s, at&t and Verizon will soon be able to offer speeds of at least 100 Mbit/s – a whopping five-fold increase. In other words, T-Mobile may be doing a great job at convincing phone users to switch to its ‘4G’ network, but many of these users may soon realize what surfing the web and downloading content at 4G speeds truly means, and may be in for a real – and very unpleasant – surprise.